Camilla, Prince Charles’ bride, is the last person I ever thought I’d relate to. But when the British press reported that she packed 50 dresses for her 5-l/2 day visit to the U.S., I was thrilled to imagine the fun of filling a mountain of trunks and suitcases. (Of course, first one must buy all those dresses, but that’s another 12-step program.) 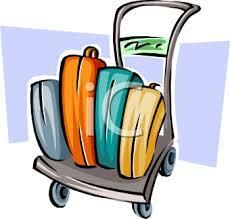 I can tell you how to pack the perfect items of clothing regardless of the duration or destination of your cruise. The problem is that I lack the willpower to follow my own advice. I’m sure Camilla over-packed with “what if” in mind, as I do. What if something unexpected popped up, or the weather turned warm, cold, snowy, hot or rainy? Or, what if she dons the blue Balenciaga dress and decides at the last minute that it really looks horrid? And naturally, none of us can predict if we’ll want to wear red or green next Tuesday. Most over-packers know they have an affliction, that it’s nearly impossible for them not to fill any suitcase to overflowing. I blame luggage manufacturers who added wheels to suitcases, making it possible for me to haul more stuff. A seven-day Caribbean cruise, for example, requires that I take nine T-shirts (the unknown color preference), three formal ensembles (one I won’t like), four baseball caps and six handbags. Let’s not even get into shoes! But I feel fairly ridiculous by the second day, when I’m so relaxed I no longer care much about what I wear. And when I arrive home and unpack a pile of unused, pressed clothes, I know I need professional help. Compulsive over-packing, like other obsessions, is surely a disease. If a 12-step program doesn’t already exist, I’ll start one. And, I’m sure a few of you will join. This article was taken from http://www.cruiseman.com/cruising101.htm On The Cruiseman Web Site.